Chanukah 2018 will begin December 2 at sundown and will end on December 10 at sundown. Chanukah, meaning “dedication” in Hebrew, refers to the joyous eight-day celebration during which Jews commemorate the victory of the Maccabees over the armies of Syria in 165 B.C.E. and the subsequent liberation and “rededication” of the Temple in Jerusalem. The modern home celebration of Chanukah centers around the lighting of the chanukiyah, a special menorah for Chanukah; foods prepared in oil including latkes (potato pancakes) and sufganiyot (jelly doughnuts); and special songs and games. 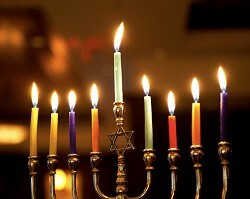 Scroll down for great Chanukah information, how-tos, activities, mitzvah opportunities, music videos, recipes, and more! Make Your Own Menorah at Home!